Tired eyes have become a common complaint for you who work daily in front of a computer or gadget. According to Andrea Thau, an ophthalmologist from the American Optometric Association, the human eye is designed to be able to see 3-dimensional objects. In the device screen, the eyes will be forced to see 2-dimensional objects which makes the brain work harder to "read" the image that the eye catches. This tired brain can also affect the inhibition of light signal processing from the eye. As a result the eyes will be so tired and blurred vision. While in front of the device screen, we are forced to focus on objects with a distance of less than 60 cm. Such coercion will trigger a complaint called computer vision syndrome (CVS), which symptoms such as dry eyes and blur, until it becomes headache.For that we need a technique so that we can still be productive and eye health is maintained. One of them with 20-20-20 tricks. Check out the following tips. 1. The first 20 numbers apply to 20 feet. 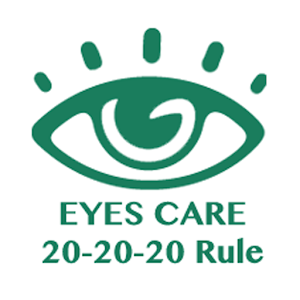 Rest your eyes by taking your eyes off the screen to an object 20 feet away. The important thing is try to turn your eyes to distant objects. For example a tree outside the window, see a distant car, and others. If you are in a small room, try to get out and "treat" your eyes with focus on distant objects. This can help the eyes so do not get tired quickly. 2. The second 20 is 20 seconds. This means you need to do the above for 20 seconds. Do not worry afraid to leave the work that accumulate because they have to turn the view to a distant object. The first way above you just need to do for 20 seconds kok. But it's good to do while getting up from the seat, to stretch the muscles as well. For example while buying or taking a drink. Because after all drinking is also important to ensure the eyes remain moist. 3. The last 20 numbers mean you have to do this method every 20 minutes. Remember, do not be lazy. Being in front of the screen with eyes focused on it for 20 minutes can make your eyes tense. The ends of the eye will be tired, dry, and possibly also a headache. You can make a reminder in front of the screen to rest after 20 minutes have passed. You can also install alarm once in 20 minutes or you can also upload 20-20-20 apps that are widely available in app stores. Now, technologies such as computers or mobile phones are so supportive of all activities. Without them, we will have trouble doing our daily work. Actually not the computer that should be avoided, but how to use it to be changed. After all, the human eye usually blinks 15 times in 1 minute. But when dealing with gadgets, winks can be reduced 3 times as much you know! So, from now on, apply the above easy methods, for the health of a healthier eye.